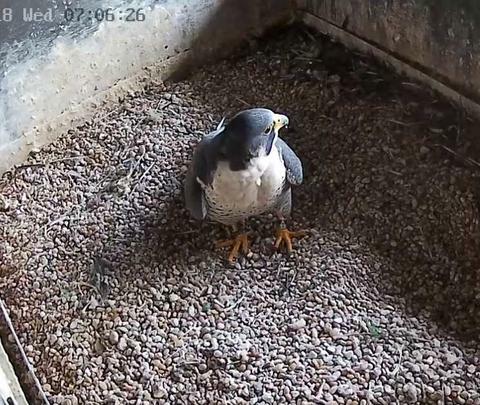 I've not seen a falcon via the cam in ages. Not sure what the problem is with one of the cams, but I'm only getting views from one of them. I'm going to passing through Wilmington in a couple weeks, but not sure if I'll have time to stop to look for falcons. Just wondering if anyone knows anything about if/when the cams will be operational. I read on Facebook this morning that the one cam should come online in about a week. The second camera has bitten the dust. I did see ONE picture of Red Girl in the nest box. One camera in Wilmington is, indeed offline for the season. The sound is also down. Now that courtship has begun the nest box cannot be disturbed, so we have to get used to one camera. Here is a quick recap of the Wilmington peregrine falcons' fall and winter season. These are observations from the ground (mostly from DuPont Plaza, adjacent to the Brandywine Building, but also from Wilmington and Brandywine cemetery and from the Washington Street Bridge over the Brandywine). Red Girl and Trinity continued to raise the four young falcons and teach them life lessons. Usually, one or two would get fed in the morning in the nest area. The ones who got fed would stay behind while the others would fly off with Trinity or Red Girl. Later in the day the morning flyers returned and the others would fly off for lessons. By August some young falcons departed. Little Sister was the last to leave. By September all had flown off to start their own adventures. Many peregrine falcons migrate to Central and South America after raising thjeir young. The Wilmington falcons' food supply is sufficient, so they do not migrate. However, their solitary nature shows after they become "empty nesters". In the fall they seldom perch in sight of each other, and one or the other may disappear for days or weeks. They defend their territory, and will still join up to chase intruders and interlopers, and occasionally to hunt, but they generally keep more distance from each other. During the extreme cold peroid in mid-December the falcons showed an unusual interest in the DuPont park pigeons. Trinity would chase the flock of pigeons, which was every bit his equal as they circled the park, dipping low and swerving around trees, signs, and other obstructions. But high above, kiting motionlessly in the cold wind, Red Girl watched, ready to dive. Pigeons that broke from the group, or who were sick, weak, or just unlucky would be vulnerable. I saw them using this technique three times during the cold snap. I did see Red Girl dive (stoop), but the end of the dive was always blocked by a building. I don't see any definitive results, but the hunts were amazing. Right around the time we humans are dealing with Christmas and New Years activities, Mother Nature starts sending the falcons a signal. Once the winter equinox passes, the days get longer. The increasing amounts of light trigger changes in the falcons' chemistry, altering their behavior. During January Trinity and Red Girl start to perch within sight of each other. By February they are exchanging vocalizations, and during early February Trinity begins bringing Red Girl gifts of food. Trinity will also begin display flights starting in late February. Often done while his lady is on the nest ledge, these are large, sweeping displays, best observed from a distance. During this period Trinity will start preparing his nests for Red Girl's inspections. 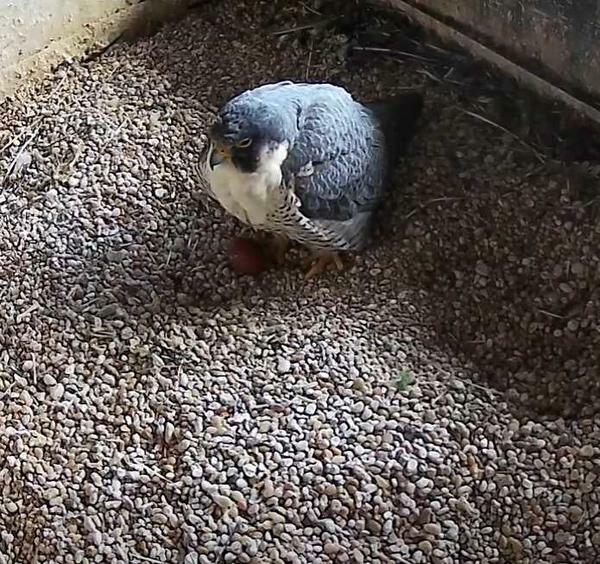 He will prepared scrapes in the gravel as locations for the egg clutches. When she inspects the sites she will make her own adjustments to the scrapes. If the nest sites meet her fancy she will spend a lot of time just looking around the nests. Won over, she will now accept his advances. They were observed mating on February 25 this year. It is too early for such matings to be successful, but the behavior is already happening. 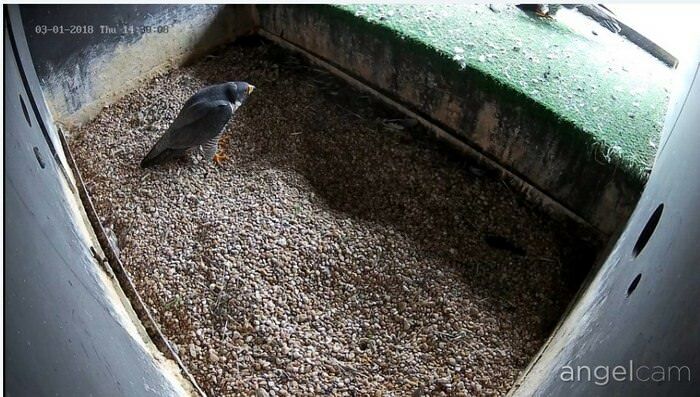 The nestbox with the webcam is obviously their most desired location, but the tercel (male falcon) will usually have another nest site is mind or in preparation should the primary one be compromised by weather or by intrusion by predators. 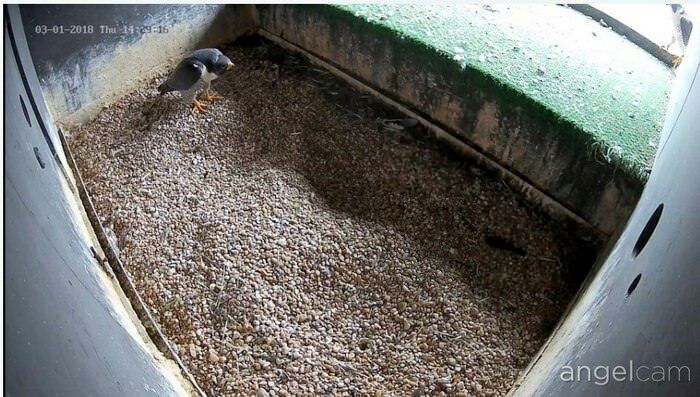 Disturbances to the nest boxes during this period can easily cause the falcons to reject their first choice and try for a clutch in an alternate site. It is the worst possible time for humans to enter or be around the box, making replacement of the dead camera impossible until the fall. Happily, our other camera is producing excellent video. So, here we go again! Happy viewing. Thanks for the update, David!! He must have brought a food gift because she went over, grabbed something, then left. Wow, Red Girl is in a hurry to get on with it. I'm having trouble getting the cam right now. Here's a short video of Red Girl with the first egg. She had laid it minutes before. Red Girl is there now, but not in the egg laying position. She's ON the first egg.